The event last year ... overwhelming response. The Big 5 Saudi has entered its fifth year and its growth to over 20,000 sq m of exhibition space is indicative of the robust drivers of Saudi Arabia’s economy. NOW marking its fifth edition, The Big 5 Saudi is expected to showcase the products and services of more than 500 exhibitors when it opens at the Jeddah Centre for Forums and Events in Jeddah, Saudi Arabia, next month (March 9 to 12). Given the significant increase in the number of exhibitors compared to last year, the event space has been increased to more than 20,000 sq m, says dmg:events, the show’s organiser. There are 15 national pavilions, with a further 12 countries represented independently. “It is an international event and we welcome national pavilions from across the world including Germany, Turkey, Greece, Italy, China, and India, amongst others,” says Waugh. This year Hungary will be making its debut at The Big 5 Saudi as Saudi Arabia is fast becoming a priority market for the industry, dmg:events points out. “It is estimated that $75 billion construction projects were awarded in 2014 alone, and an estimated $200 billion in contracts will be awarded over the next couple of years,” he says. Last year the organisers expanded the event to include education segments and intend to build on that this year as well and provide more tailored workshops for interested visitors. “From experience, these educational sessions have always been popular. So this year, we have partnered with Construction CPD Certification Service to provide Continued Professional Development (CPD)-certified workshops that will help people further a career in the construction industry and ensure professionals are up to date with technological advances,” says Waugh. Waugh says the theme of sustainability, amongst others, is clearly woven throughout the fabric of the exhibition, not only in its educational offering but also through the products and services offered. 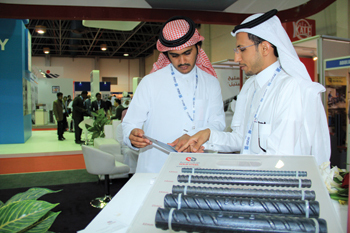 The show is an ideal platform for construction companies to showcase new products. “This is because it is a significant area of interest in Saudi Arabia and so we have identified this as a key area to focus on. “There will be plenty of new offerings for 2015. For example, in 2014, we launched the two-day ‘Seminar Series’, which proved to be extremely popular. We have now increased this to over 20 sessions this year and we will be running more ‘free-to-attend’ workshops that are officially accredited by CPD. These seminars cover areas such as asset maintenance, project management, market overview and an introduction to the Leed (Leadership in Energy and Environmental Design) rating system,” Waugh says. “We believe that including more learning-focused elements, whilst still continuing to offer the widest range of international products, will generate a higher volume of visitors, leading to more opportunities and a better return for our exhibitors. Waugh says The Big 5 is an ideal platform for construction companies to showcase new products as the event provides direct access to end-users. “We have seen several product launches over the years and we anticipate there will be many more this year,” he indicates. The Big 5 Saudi will also feature PMV and Concrete Zones. “With the number of large-scale infrastructure and construction projects in the kingdom, it is natural that the construction machinery and vehicles industry will have a large role to play. 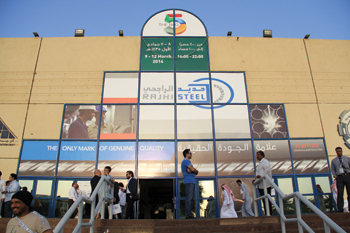 This is why The Big 5 Saudi has a dedicated zone outside Hall One for all of these plant machinery and vehicles,” he says. The zone will feature earthmoving, lifting and access equipment, generators as well as other heavy machinery and accessories. A dedicated Concrete Zone is located inside Hall One and products on display will include precast production equipment, formwork, admixtures, concrete finishing products and many more concrete-related products.